If there’s one line the abortion industry has used most often to convince Americans that abortion is necessary, it’s the infamous “safe, legal, and rare” mantra promoted by former President Bill Clinton. By their own admittance, therefore, abortion shouldn’t be something that is celebrated and happens often. After all, if something is positive and good, why would we want it to be rare? But now, a new PSA casting call for Planned Parenthood proves the abortion crowd is switching gears to promote a celebratory abortion mentality. We are casting a PSA for Planned Parenthood to emphasis the positive impact of ROE V WADE to represent that the decision was for women’s ability to control their bodies and lives to more equitable foothold in society – the ability to pursue career and educational opportunities; the ability to lead the life they want for themselves and their families. While this isn’t a shocking move on the part of Planned Parenthood, it is abhorrent. 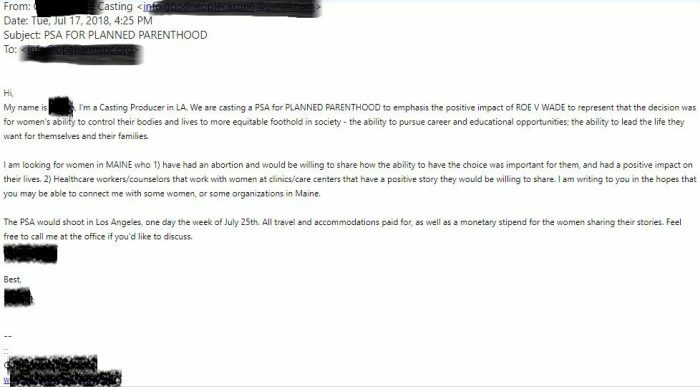 Email from a casting agency requesting women to share abortion stories. And all too often, abortion leads to the destruction of women’s bodies as well, through complications and even unreported sexual abuse that has been allowed to continue, in many cases, thanks to Planned Parenthood. In addition, abortion doesn’t give women a “more equitable foothold in society.” It is an attack on women, belittling them with the mistaken belief that in order to be equal to men they have to sacrifice the lives of their own children. Abortion tells women they aren’t good enough to be working mothers. Abortion tells women they aren’t smart or strong enough to be pregnant or parenting students. It tells women they are alone in the world. 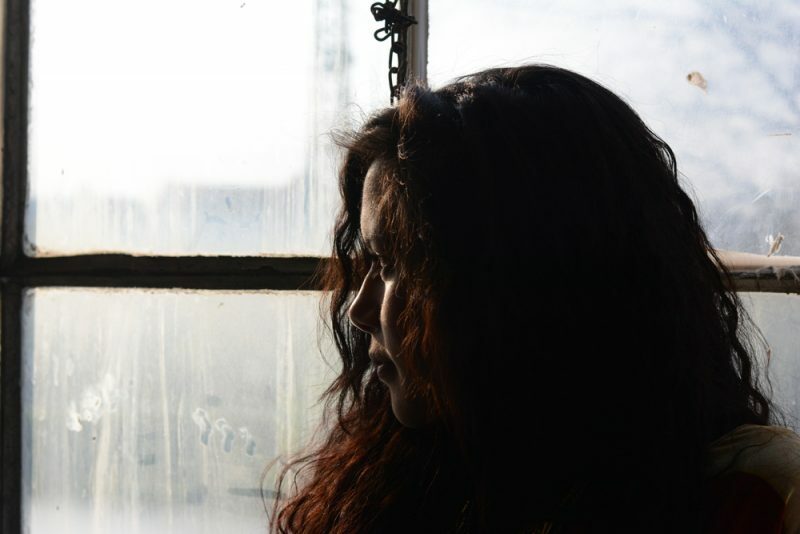 It leaves women with a lifetime of guilt over a horrific act — one that most often they felt societal pressure to commit. No one should ever build their success on the bodies of other people. It isn’t children that stand in the way of women achieving their educational or career goals. It’s society. Rather than killing preborn children simply because they exist, women need programs to allow them to continue to receive their education and work without feeling as though they are being punished for becoming mothers. They need access to pregnancy resource centers that provide emotional and material support to women facing unplanned pregnancies, including baby gear, formula, clothing, parenting classes, help with childcare and even housing. Women should be told that they are capable of being mothers and earning their degrees or building their careers. With the right support, they can overcome every obstacle without having to kill another human being. Why is Planned Parenthood changing its narrative? It turns out that keeping an abortion business in the black doesn’t happen by making sure abortion is “rare.” The organization’s legitimate health services are declining, and while abortion numbers decline nationally, Planned Parenthood continues to hold its place as the market share leader of abortion. With this new PSA, Planned Parenthood aims to convince us that abortion is a victory instead of the tragedy it really is, continuing to build its business on the pain and suffering of women and the deaths of children.